It is widely accepted in the received literature that the decisive feature in the constitution of community, and indeed its ontological core, is some sort of collective acknowledgement of the community, and mutual recognition between the members. A prominent version of this claim is that communities exist insofar as their members believe they exist, and that the communal bond is mutual sympathy. Yet this view is at odds with rather obvious facts: community members often dislike each other, and are far from acknowledging the existence of any such bond. How can these phenomena be accommodated in the view that community is a matter of attitude rather than of brute objective facts? This paper suggests an answer that is inspired by the work of the German phenomenologist Hermann Schmalenbach (1885–1950). The claim is that the basic communal ties are plural implicit self-knowledge of the participants as members of the community. Implicit self-knowledge is often not reflectively transparent. Community members are plurally self-aware without thinking of themselves in “we”-terms. Where individuals consciously conceive of themselves as members, the community is turned into what Schmalenbach proposes to call a communion. 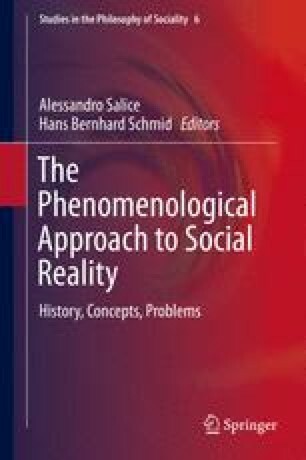 I am grateful to the participants of the Workshop “Social Reality – the Phenomenological Approach” as well as to two referees for useful comments. Schmid, Hans Bernhard. 2014b. Expressing group attitudes: On first person plural authority. Erkenntnis 79: 1685–1701. doi: 10.1007/s10670-014-9635-8.